Installation of EQuIS Alive involves installing the program and updating an existing database with the Alive Database Schema. 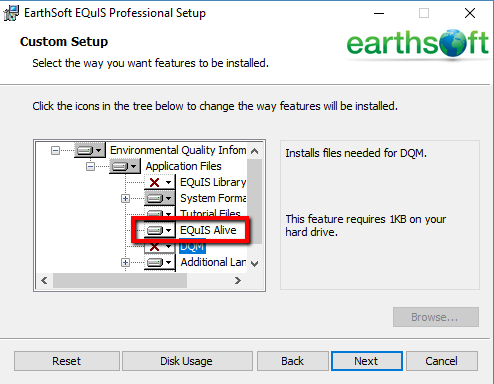 To install Alive, select the Alive module during the installation of EQuIS Professional (Version 6.2+). If EQuIS Professional is already installed, the installer can be run again to add the Alive module. When complete, verify that EarthSoft.Forms.Library.76296.dll is in your EQuIS Professional folder (e.g. C:\Program Files\EarthSoft\EQuIS). To begin, update the database with Schema.Alive.xme. Note the database must already be updated to EQuIS v6+. For SQL Server, follow the updating database steps in the help article Update EQuIS Database. Refer to the Loading Reference Values article for these steps. The six standard reports for EQuIS Alive and their associated dlls are listed below.